Our latest trip we weren’t super hungry, but Molly hankered for a delicious cocktail and we both wanted a nice outdoor spot to relax. The patio at Alvah is heavily shaded, which makes it perfect on summer days that get above 80. We tried 2 cocktails and loved them both. The first, a summer special called The Blue Ribbon. Apropo of the name this beauty won the Hitchcock Center for The Environment’s Battle of the Botanicals, whatever the hell that means. It had Ferrand Cognac, Jameson Black Barrel Whiskey, Becherovka, blueberry syrup, lemon juice, and was delicious. The other cocktail was The Sylvester- Fidencio Mezcal, Espolon Reposado, Aperol, grapefruit, lime, and agave. I love a good smokey mezcal straight, but have never been able to tame it appropriately in a mixed beverage at home. Alvah Stone succeeded where I and I’m sure many other more capable bartenders have failed. It was “just right” on the smokiness, and rocked every square inch of our palettes. Oh yeah, and we had a bunch of “small” plates that were generous and each superb in their own way. 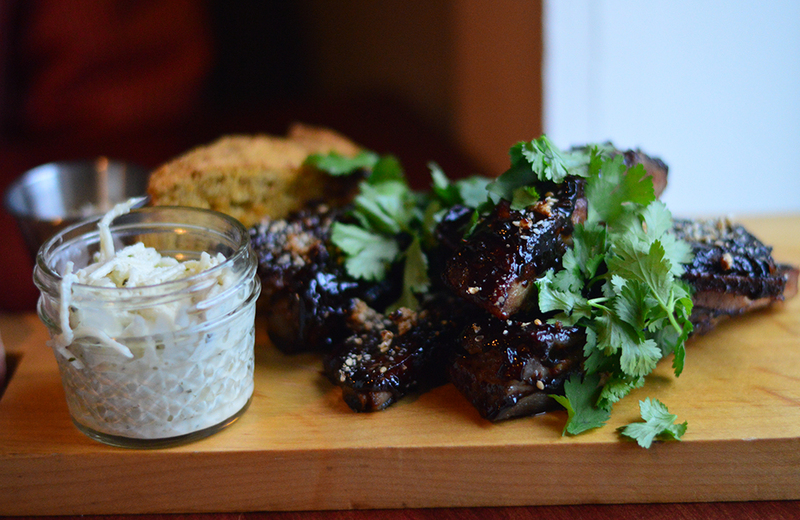 The smoke was the theme of our night apparently, with the Smoked Sorghum Chicken Wings. It wasn’t the first time we had the Broccoli with XO and Thai Chiles, and if definitely won’t be the last. We had The Cabbage Salad with lemongrass, ginger, chopped peanuts, fried shallots, and herbs. The coconut dressing was surprisingly light and the extra kick of spice was on point. Our favorite small plate of the evening was the Douille Dog, which came on a fresh brioche roll with pickled jalapeño and more of those fried shallots. We can’t get enough of Alvah and hope they’re around for a long time. They’ve certainly bumped Montague up our list of possible towns to move as our house hunting adventures continue. The staff, as always, were as friendly as they were knowledgeable about their menu. We had fond memories of The Night Kitchen when we left for California a couple years ago, but once we got back in December of 2014 we couldn’t remember the food so much as the absurdly perfect setting. We heard great things about the new tenant, The Alvah Stone, and were not disappointed on our first visit. We arrived early. We had reservations, but I wanted to check out the bar. The more upscale a place gets the more I like to get my bearings there. Maybe because that’s where I used to be so often when I was on the serving side of the white linen scene. The bar is where the pressure is off. You can take as long as you need to order food (or not order food at all) and you immediately feel taken care of in this “we’re entertaining at the country house” kind of way. The bar is where you get intricate cocktails made with casual-cool fanfare. It’s still fancy-pants, but it’s chill. Molly had an Old Fashioned. It was pretty by the book, but got extra points for the ice globe that meant it wasn’t watered down at all with chipped ice. I tried the Spencer Trappist Ale and it was perfection on tap. We were told it was the only certified Trappist beer made in the US, so another few points for knowing your stuff. 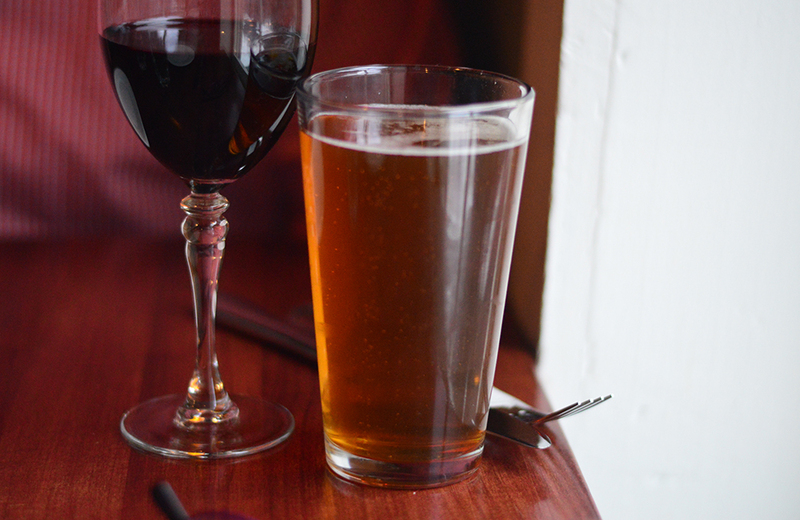 For dinner we had wine and a beer brewed for The Alvah Stone by Brewmaster Jack. We moved to a window-side table overlooking the equal parts frozen and roaring river. This was the aspect of The Night Kitchen we remembered. The interior of The Alvah Stone has only improved upon an already gorgeous experience. The interior is rustic, but still elegant and charming without losing its grace. It’s James Bond on his day off fly fishing in weathered attire from Patagonia. We started off with a Kale Salad that was inspired. 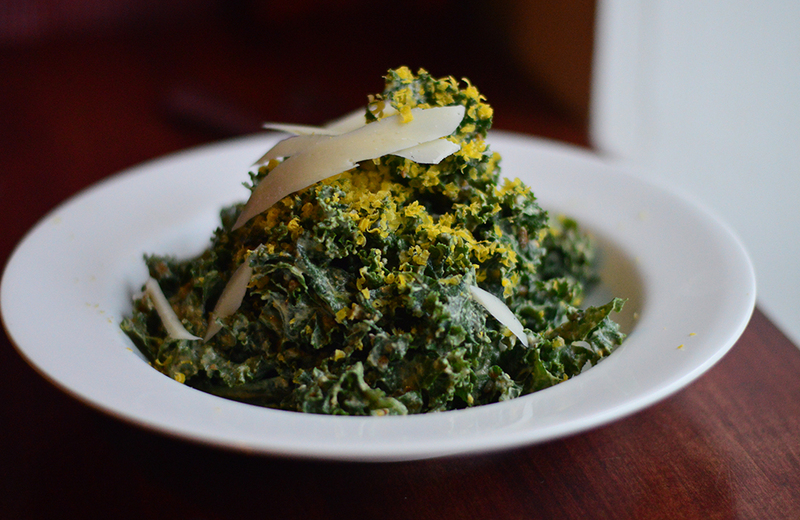 Molly is usually not a fan of raw Kale, but Alvah Stone does theirs with a cured egg, pistachios, and quality aged provolone. Cured Egg? Yeah, we had to ask too. We got a good description from the bartender who essentially told us it turns an egg yolk into something like a dense cheese. Sauver has a simple recipe we can’t wait to try on everything. The salad was really my favorite thing all evening after the Trappist Ale. 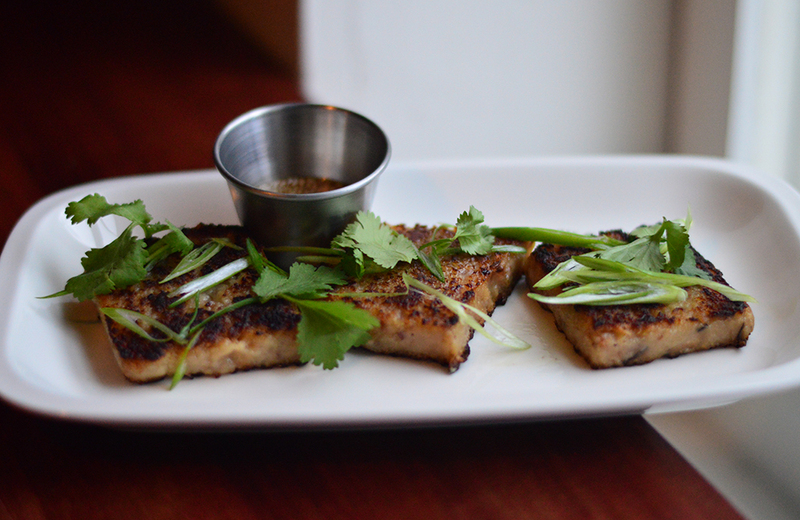 We also had the Turnip Cakes from the “snacks” portion of the menu. They were solid, if a little overshadowed by the salad. We’d order them again if just for the delish Asian-inspired dipping sauce, but we’d definitely get them on their own so they wouldn’t have to compete with any other flavors. For all its bold ingredients (cilantro, scallions, sesame) we found these a little on the mellow side. I was very tempted by the Sirloin special, but I’d already read the menu by the time I heard it so I had ribs on the brain. They were generously sauced in some house-made genius, but were surprisingly snug on their bones. I love getting down and dirty on some ribs, but like how cooked to disintegration messy meats are usually prepared in finer dining. I had short ribs at Chez Albert a few weeks ago for example that I could have eaten with a wobbly plastic spoon. That’s not a complaint because they were yummers, just a heads up if you arrive in your Sunday best: you’re gonna work for them ribs, Hoss. My sides were across the board great: smoky cow peas, kohlrabi slaw, and some weird but great squash cake that was like an exotic cornbread. Molly had seared sea bass with blood orange slivers and what we think was daikon radish, but couldn’t be sure. It was cooked flawlessly. 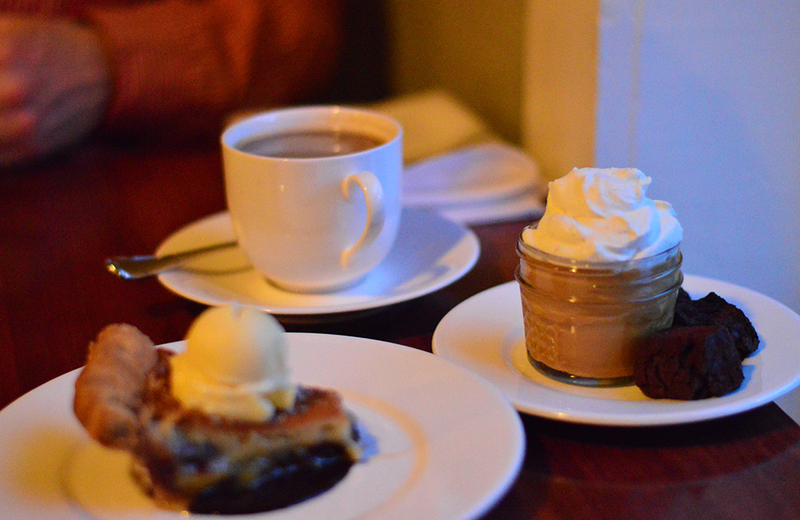 I had a salted caramel custard with whipped cream accompanied by the cutest, crunchiest, chocolateyest cookies. Molly is still talking about the cookies, which had the slightest hint of Oreo if that humble cookie could be reverse engineered and greatly improved upon. Molly got a buttermilk pie that was as by-the-book as her Old Fashioned, but also as good. All in all we found the experience great. 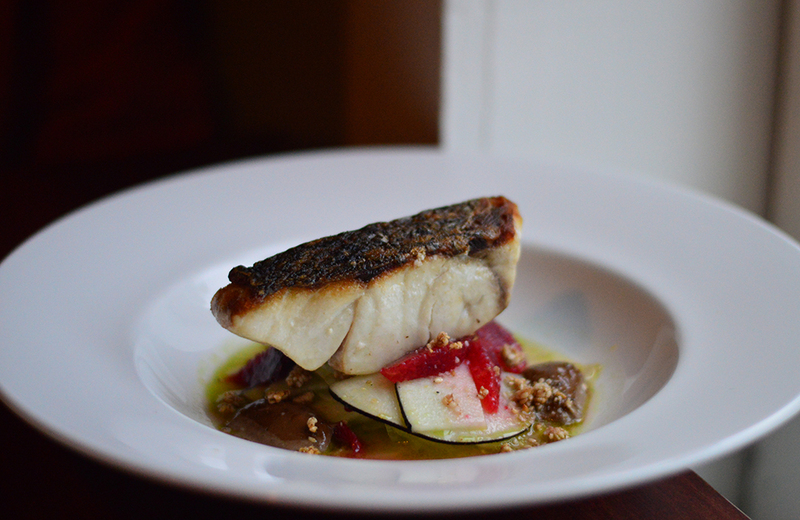 The Alvah Stone seems to be straddling the classics and their own drive to be inventive. They’re doing both admirably, and we think a year from now, or two, those two worlds will be more seamless as they create some “old standards” of their own.